We are very proud to be the exclusive Canadian dealer of premium outdoor pizza ovens by Zio Ciro. 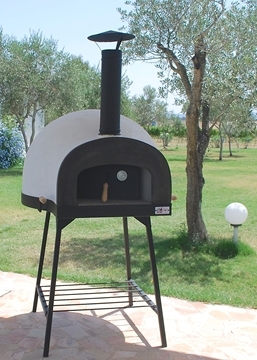 Zio Ciro wood-gas fired pizza ovens are crafted in Sardinia, Italy by skilled artisans from only the best materials. Zio Ciro ovens are made from high quality refractory concrete ensuring long term durability and reduced wood consumption compared to a traditional oven. The ovens come as an easy to assemble kit containing all the necessary parts and easy to follow instructions. A small-medium portable oven, perfect if you have limited space or if you simply want something pre-built and ready to cook in. Compact and well insulated, this wood-fired oven will heat up fast and retain its heat for a long cooking cycle. Subito Cotto is a proper woodburning oven of small dimensions; high quality refractory cotto floor and refractory concrete dome. Thanks to the highest quality in materials and characteristics it is a proper woodburning oven, but only of small dimensions. It mantains temperature for a long time even after fire extinguishes. Size: 32"
36" Portable Oven with Metal Stand, Fully Assembled. 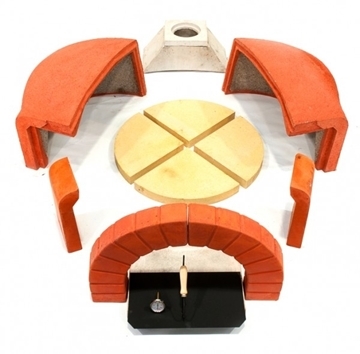 32" Modular Refractory Oven, DIY Oven Kit. 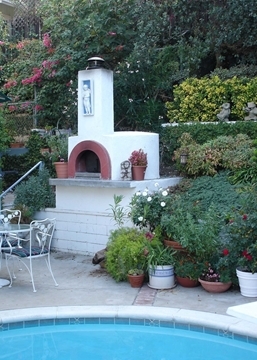 A compact pizza oven, it’s perfect for outdoor kitchens and for fitting in projects where space is limited. You can fit in two 12” pizzas or a small turkey for example, so you can get a lot of cooking done for your family and friends. 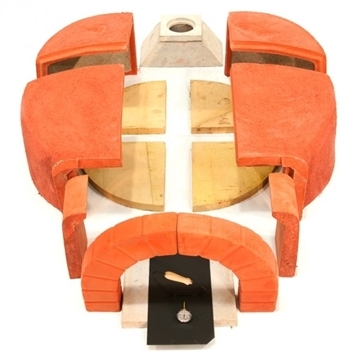 36" Modular Refractory Oven, DIY Oven Kit This Italian oven is a good medium size for family entertainment and it can easily be placed outdoors. Heating up quickly, it can manage a holiday party as well as a relaxed weekend gourmet meal. 39.3" Modular Refractory Oven, DIY Oven Kit Our medium sized Italian oven with plenty of cooking space to bake a large gourmet meal to entertain your guests. And yet it's the perfect size so that it heats up quickly if you decided to make just a few pizzas on the spur of the moment. 44" Modular Refractory Oven, DIY Oven Kit This is the oven for the home chef needing extra space for cooking … your friends will love you for it! It also easily accommodates the needs of a larger family and extended cooking for holidays and parties. 47.2" Modular Refractory Oven, DIY Oven Kit An oven made to easily entertain larger gatherings with ample space for a wide range of dishes. If you would like to own a large oven, this one is for you! You can fit two large turkeys and still have space for an extra roasting pan on the side.